I have recently purchased an R33 Nissan Skyline with the RB25DET engine. I wish to do away with the OEM ECU setup and run FreeEMS. I will be designing a PCB that fits inside the R33 RB25DET ECU enclosure, uses the exact same pin-out and harness receptacle/connector as the OEM unit and enables the use of MAP instead of MAF (big winner in my book) with USB communications. 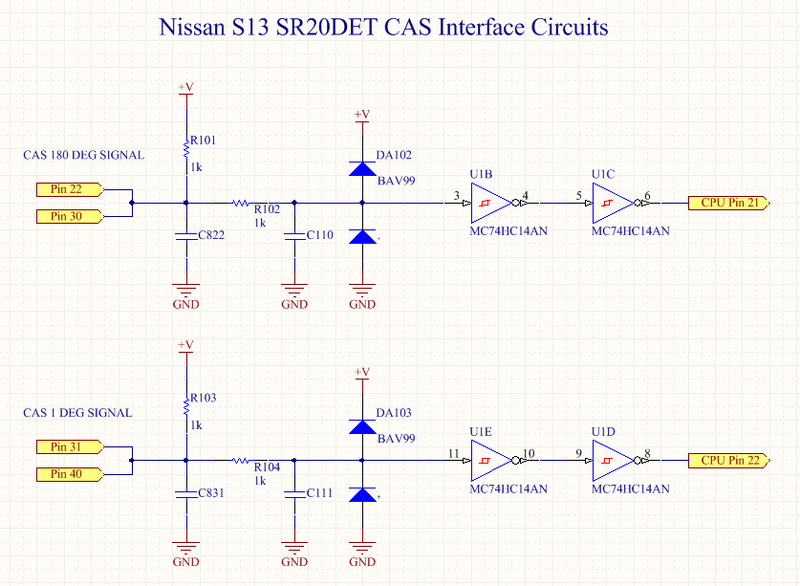 This afternoon I studied my S13 SR20DET Redtop Manual ECU CAS interface circuits and knocked them up in Altium for clarity (see below). The SR20DET uses the same CAS as the RB25DET so I wanted to investigate how Nissan handled the interface to their CPU and attempted to filter out noise. The 74HC14A looks like a nice schmitt trigger, as it has a better level of hysteresis than most schmitt trigger's around and comes in an automotive rated part. I think something as simple as this could work nicely. I am going to also grab another R33 RB25DET Manual ECU from a friend (I don't want to fiddle with mine just yet) who has offered to lend it to me and draw up the circuits it has and see if it is different or similar. EDIT: added explanation as to why the sr20det ecu circuits were looked at. Short of finding stock ecu's to raid them from (not possible as there are NONE of these at any of my local wreckers) does anyone know where these can be purchased cheaper? One could also probably de-solder their header from their OEM unit when swapping out PCB's when this project is at the PCB production stage too if necessary. Hi Dan and everyone else. I signed up here quite a while ago so this is probably a weird ( or creepy ) time to jump in. Having learned a lot from reading here and always wanting to contribute, this thread has finally brought me out of the woodwork. I own the same car ( R33 ) and worked on the same kind of project ( R33 ECU in factory enclosure/factory connector ) for my study. My own design is focused on through hole components and used another type of MCU ( PIC32 ), so is probably different enough to not be useful, although it is heavily influenced by RavAGE and I'm happy to share any info. Anyway to get to the point, I'd love to contribute if I can be of any use and this is exactly what I was trying to do on my own. I even bought the connector from the link mentioned above. Have attached the datasheet for the ECU side connector. I could only find them with large minimum order quantities of hundreds or more hence why I paid $65 from Wolf EMS. Dan, if you need any pin out info or would like to collaborate let me know, I was hoping to build a product that would work with many of the Nissans that use this sized ECU ( R32/R33, S14, Z32 etc ) so have done a fair bit of research into it. I should probably introduce myself better and could go on for ages about my own project but have already clogged your thread enough. Cheers, Rob from Auck, NZ. Dan, you, as an Ozzy, can access http://trademe.co.nz and should be able to pickup a skyline ECU from there for pretty cheap, I would think. Re connectors, you can get clone connectors from China, it's just a matter of finding them. However supply may also be large quantity, it might be cheap enough to consider. Corbon - great stuff. Please share your pinout information and we will go from there welcome aboard! Fred - will check trademe.co.nz and some china suppliers that i already use. Thanks. Yep, found them in china from one of my suppliers. Will revisit this when the time comes. Last edited by Dan on Fri Aug 30, 2013 2:52 pm, edited 1 time in total. Re circuit, it bothers me, but you'll find that the C111 and C110 are very very small caps so the low pass filter isn't significant. If you could feed a high frequency square wave in and watch the output of that, you could calculate the capacitance from the decay curve.